The first Grove GRT880 rough-terrain crane in New York City is working hard for Great Lakes Dredge & Dock (GLDD), one of the largest providers of dredging services in the United States. Since September 2017, GLDD has used the 80 USt crane for vessel repairing operations and marine equipment installation at its Staten Island facilities. Before acquiring the GRT880, one of Grove’s latest rough-terrain models, GLDD had been using multiple cranes to do the same amount of work. This spike in efficiency was largely due to the GRT880’s versatility and maneuverability, which also made it ideal for working in the tight quarters of GLDD’s shipyard. Stephan Brogna, yard manager for GLDD, said that the crane’s enhanced performance has already made an impact on the company’s bottom line. With increased capacity at mid-range and maximum radii, the GRT880 is more versatile than competing rough-terrain cranes. It boasts up to 16 percent greater capacity at full radius, 13 percent greater capacity in mid-range applications and 27 percent greater capacity at close radii. The GRT880’s 135 ft main boom was designed using Grove’s latest formed boom technology, which utilizes laser welding as opposed to the traditional submerged-arc process. With a full complement of offsettable boom extension and insert options, the crane’s main boom tip height of 146.2 ft can be increased to as much as 223 ft, offering outstanding reach on the job site. 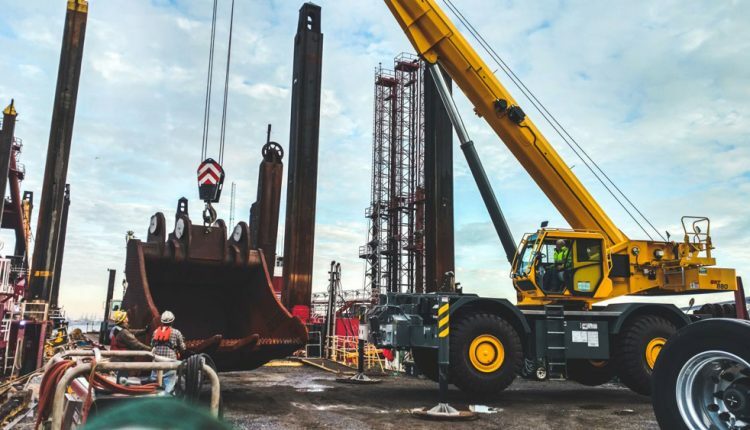 GLDD’s GRT880 was provided by Piscataway, New Jersey-based Hoffman Equipment, a Manitowoc dealer with four locations in New York and New Jersey. The company has been renting, selling and repairing construction equipment both in the United States and abroad for the more than 40 years. Great Lakes Dredge & Dock Company (GLDD) leads the North American market as the largest industry service provider of marine dredging and is the only U.S. company with substantial overseas dredging operations. Leading a diverse dredging fleet, the Oak Brook, Illinois-based company owns numerous specialized maritime vessels and operates marine yards in five locations nationwide.